Project SEE (Slough-based Environmental Education) began in 2006 and is led by Watsonville Wetlands Watch staff who brought together a cadre of dedicated beginning and veteran Pajaro Valley High School teachers to create meaningful hands-on curriculum for high school students. 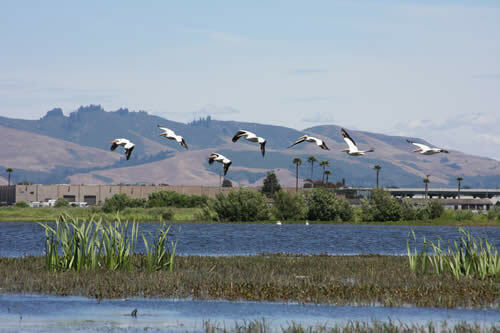 All of the lessons in this guide are inspired by the surrounding Watsonville wetlands and incorporate the ecological, geographical, and cultural elements of the Pajaro Valley. By accessing community resources such as local parks, museums, nature preserves, or other natural resource providers, teachers may use these lessons as models for engaging students in environmental stewardship, or modify these lessons as they develop meaningful experiences for their students that are applicable to their immediate surroundings. Through participation in Project SEE lessons, students become exposed to principles of wetland stewardship. Over the course of the last two years we have observed that students involved in Project SEE become more engaged in their classes through the hands-on activities which are fundamental to the curriculum. This highly interactive approach to learning provides a real life context for class subjects. 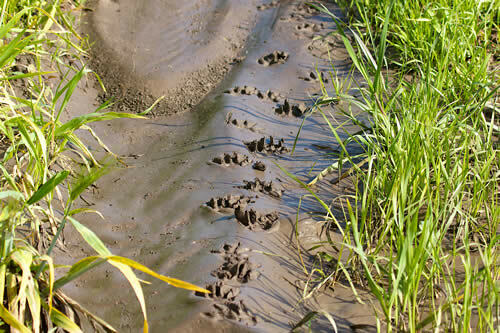 In Agribusiness and Wetlands, students will use matrices to determine the optimal allocation of land between development and conservation based on a series of negotiated constraints. Students will extend their previous experience with solving two variable linear systems to working with three variable systems, then four and six. Students will review how inverse operations have been used to balance equations and to solve systems. They will learns how to apply all of these concepts to solving a six variable linear system using the technology available with graphing calculators. All of this work and study will be done in the context of the wetlands system that surrounds Pajaro Valley High School. Students use the internet to become acquainted with different habitat types and ecosystems in their community. They will research what organisms exist in these areas and find out if and how they are being threatened by natural and human impacts. They will utilize the information they find to make recommendations on how to reduce these negative impacts to the organisms of these habitats. In groups students prepare a newsletter that highlights their findings and recommendations. Students will then showcase their findings through classroom museum exhibits. Students become the curators and present these to others. A visit to a local museum of any type is highly recommended so students have a model by which to compare. Students will form groups to create a travel brochure for a particular wildlife habitat. Each group member will research and advertise the habitat from the perspective of either a) travel agent, b) a recreation director, c) an ambassador of the habitat, or c) a tour guide/historian. Students will examine the biotic factors and abiotic factors in a unique habitat and highlight the animal species that live in these areas. Each group will then present an argument for their habitat as the "best vacation spot" for visiting animals or insects. Stretching from Monterey to Santa Cruz, California, the Monterey Bay has been both physically and culturally impacted by succeeding waves of inhabitants. While the native Ohlone inhabited the area for about 10,000 years without making any significant environmental impact, the Spaniards, Mexicans, and most recently, Californians have radically altered the landscape and destroyed the Ohlone’s culture existence within a span of only 250 years. This lesson serves to introduce students to the evolution of cultures in the Pajaro Valley, and allows students to analyze how different cultures have impacted each other and their environment. The native people of the Pajaro Valley valued the wetlands as a source of food and building materials. The Spanish and Mexicans saw them both as a source of water and as an obstacle to the raising of cattle. The Americans valued the water, yet wanted the land for farming, and wanted to control the direction and volume of water flow. They also viewed the wetlands as breeding areas for mosquitoes and disease that could be eliminated. Today the wetlands are increasingly appreciated again as an ecologically-essential habitat for birds, mammals, fish, insects and plants. In this lesson students analyze the relationship among the rise of industrialization, large-scale rural to- urban migration, and massive immigration from Southern and Eastern Europe. The Pajaro Valley's physical features were much different when the native Calendarucs population occupied the region, a population whose hunting and gathering subsistence left behind little if any environmental footprint. Fresh water once flooded the central valley for much of the year and lakes dotted the upland areas; the spread of salt water into the Monterey Bay is a fairly recent ecological evolution. In the past, the highlands also were more forested and included vast stands of redwood groves. In this lesson students will be introduced to the natural environment of the Pajaro Valley and Monterey Bay so they have a basis for understanding the impact humans have had on the landscape. This lesson is classified as “beginner” in difficulty. Teacher familiarity with basic concepts of Ecology is recommended. The students will be introduced to the concepts of biodiversity and interrelatedness through the exploration of the West Struve Slough, a habitat unique to the Watsonville wetland system, the only major coastal freshwater wetland area between Arcata and San diego. Through this unit, students will begin to understand and learn to describe a stable environment. Students will also have the opportunity to describe or predict how interactions between the biotic and abiotic components of an ecosystem can impact the stability of that ecosystem. The students will examine the native flora and fauna populations, learning how different abiotic conditions such as the water, carbon, and nitrogen cycles provide an environment conducive to photosynthesis and respiration to support the flora and fauna species. By studying the ecosystem, the students will learn the ecological importance of biodiversity, interrelatedness, and the possible short and long-term effects of changes to local/ global climate and or human impact upon fragile ecosystems both locally and globally. This lesson provides an introduction to evolution through hands-on observations of wetland plant species in a natural, yet disturbed, habitat. Students use evolutionary concepts to make assumptions about why certain plants are dominant in this setting. This is a quarter long project in which students will be introduced to environmental water testing. Students will become familiar with a variety of water quality tests used by environmental scientists to monitor the quality of our water resources and the health of fresh water aquatic ecosystems. Students will be assigned and research one or two water quality tests.The WQTP engages students in four series of lessons designed over a six to eight week project period. Each lesson is sequential in terms of building a level of understanding for students of water quality monitoring practices. Through this sequence of lessons, students will become familiar with West Struve Slough, and learn how to effectively monitor its water quality. An outcome of this project will allow students to share their project information with a local water management agency. In this way, students will have an opportunity to become proactive with respect to managing a precious natural resource, our local wetlands. Students in beginning or intermediate level Spanish (year one and/or year two) are introduced to vocabulary specific to wetland wildlife. 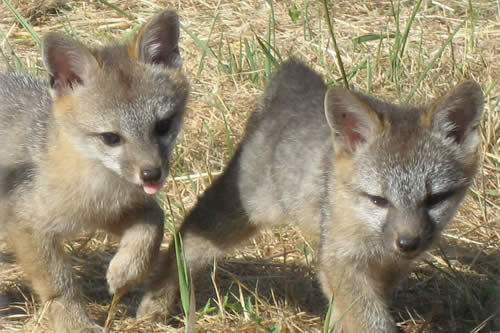 This lesson is designed so that these students are able to explore their immediate school surroundings, and are able to learn vocabulary specific to wildlife in these surroundings. 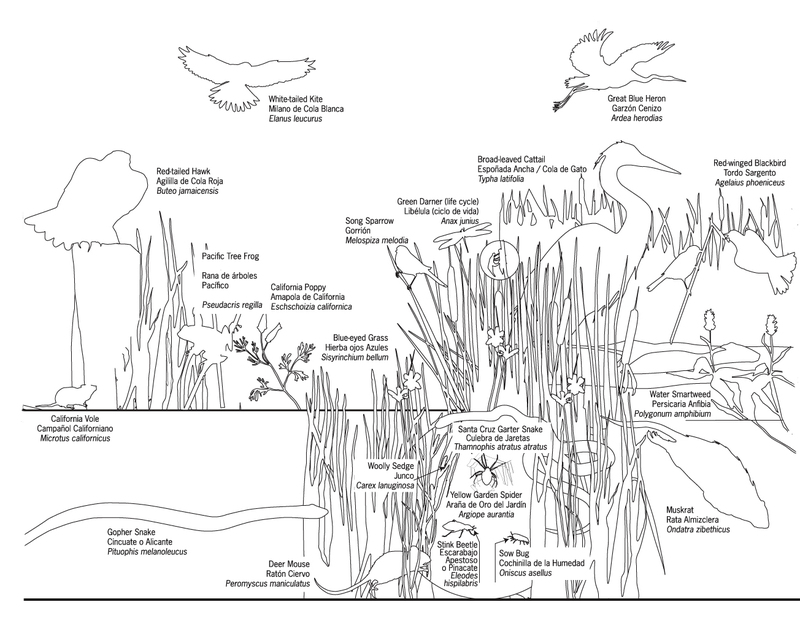 Through this study of wildlife characteristic to surrounding school wetlands, students will be able to more accurately describe plants and animals and their habitats using appropriate language in English and in Spanish. Students will be able to improve their understanding of their immediate natural environment as well as develop a capacity to become life long learners and caretakers of the environment. Students will examine aspects of native plants to develop and create a landscape painting. Their paintings will be composed of close-up, near close-up and landscape views of their chosen native plant specimen(s). From nature center visits and selected school campus natural settings, students will draw multidimensional views (a complete aspect) to compose a basis for their watercolor paintings. Professional plant specialists, illustrated plant study guides and selected potted plant specimens will support students in developing an accurate representation of native flora. Through this experience, student swill have an opportunity to develop accurate drawing and painting skills and to explore native flora as they produce a watercolor portrait of a natural landscape surrounding their school campus. Students will be asked why there is so much graffiti in Watsonville or their community. What is its purpose? Has graffiti always existed or when would it have begun? Students will then learn to make their own primitive paints and brushes. Students will draw native plants and animals with charcoal. Students will then paint over their charcoal drawings using homemade supplies. Students will then reflect on the beginning discussion regarding graffiti and see if their responses remain true. This lesson will guide students through a two week instruction on how to create a scientific illustration of native plants. As a result of participating in this lesson students will gain not only an appreciation for native flora and be able to differentiate between native vs. non native plants, but the students will also gain awareness of the seasonal effects on the visual character of plants including the colors and other noticeable attributes. In addition to the scientific characteristics of the plants, the students will broaden their artistic abilities putting to use the elements of art to show value (closer lines/darker, farther apart/lighter),illustrate visual texture of a natural object (native plant) and how to draw contour line to show an outline of an object. Finally the art students will have an opportunity to explore the use of color in regards to the colors found in nature. In the final week of instruction the students will walk away with a final illustration of a native plant and a written reflection on their lesson experience and the connection they found between Science and Art.